1. Julio Teheran – RHP – ATL – 6’2″ 150 – 1.27.91. Signed: Columbia 2007. Teheran has everything you look for in a pitcher. A live arm that consistently produces mid 90’s fastballs, good secondary stuff and command of all pitches. 2. Jeremy Hellickson – RHP – TB – 6’1″ 185 – 4.8.87. High School: Des Moines (IA) Drafted: 4th Round 2005. The Matt Garza trade to the Cubs opens up a rotation spot for last year’s Minor League Player of the Year. 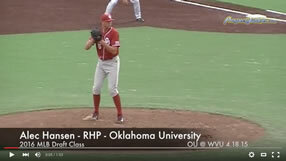 I had the pleasure of watching Hellickson pitch last year, click here for my scouting report. 3. Michael Pineda – RHP – SEA – 6’5″ 250 – 1.18.89. Signed: Dominican Republic 2005. Just as I’m partial to patient hitter, I’m a sucker for power pitchers especially when they throw 100, and post a K/9 of 9.9 to just 2.2 BB/9. 4. Jamison Taillon – RHP – PIT – 6’5″ 225 – 11.18.91. High School: Woodlands (TX) Drafted: 1st Round (2nd Overall) 2010. Had Bryce Harper not decided to forgo his junior and senior year of high school to attend junior college in order to become draft eligible a year early, Taillon would have been the first overall pick last year. He’ll join Stetson Allie at the Pirates loaded Low A West Virginia affiliate. 5. Matt Moore – LHP – TB – 6’2″ 205 – 6.18.89. High School: Edgewood (NM) Drafted: 8th Round 2007. All Moore has done is lead the minor leagues in strikeouts in each of the past two years. From 2007-2010 he’s posted K/9 ratios of 12.8, 12.8, 12.9 and 12.9. 6. Zach Britton – LHP – BAL – 6’3″ 195 – 12.22.87. High School: Weatherford (TX) Drafted: 3rd Round 2006. It should also be noted that I’m a sucker for lefties with plus change ups and Britton possesses just that. 7. Shelby Miller – RHP – STL – 6’3″ 195 – 10.10.90. High School: Brownwood (TX) Drafted: 1st Round (19th Overall) 2009. The 2009 draft was loaded with prep pitching talent and Miller had the most impressive debut among his peers. He posted a dominant 12.1 K/9 in the Midwest League on his way to being named the league’s #2 prospect. 8. Jarrod Parker – RHP – ARI – 6’1″ 180 – 11.24.88. High School: Ossian (IN) Drafted: 1st Round (9th Overall) 2007. Parker was on his way to becoming one of the top prospects in baseball before having Tommy John surgery. He’s now back and will start the year in AA. 9. Jacob Turner – RHP – DET – 6’5″ 210 – 5.21.91. High School: St. Charles (MO) Drafted: 1st Round (9th Overall) 2009.Turner drew Rick Porcello comps for his size, stuff and bonus demands and ended up with the same Detroit Tigers. Here’s hoping the Tigers don’t have Turner skip AA and AAA like they did with Porcello. 10. Martin Perez – LHP – TEX – 6’0″ 180 – 4.4.91. Signed: Venezuela 2007. Perez had a rough go at AA in 2010 but he did it as a 19 year old. I haven’t lost faith. 11. Kyle Drabek – RHP – TOR – 6’1″ 190 – 12.8.87. High School: Victoria (TX) Drafted: 1st Round (18th Overall) 2006. Like Parker, Drabek is a brave Tommy John survivor. He has a chance to make the Jays rotation out of spring training and even if he doesn’t, he’ll still get around 20 MLB starts. 12. Randall Delgado – RHP – ATL – 6’3″ 165 – 2.9.90. Signed: Panama 2006. Delgado draws comparisons to his farmmate Julio Teheran because of his electric arm and strikeout ability. Like Teheran he has 3 potential plus pitches and controls them well. He’ll start the 2011 season in AA and could be in Atlanta by season’s end. 13. Mike Montgomery – LHP – KC – 6’5″ 180 – 7.1.89. High School: Valencia (CA) Drafted: 1st Round Supplemental (36th Overall) 2008. Like I said, I’m a sucker for lefties who throw a plus change up. 14. Tyler Matzek – LHP – COL – 6’3″ 210 – 10.19.90. High School: Mission Viejo (CA) Drafted: 1st Round (11th Overall) 2009. It came down too the 11th hour, but the Rockies signed Matzek away from his Oregon commitment for $3.9MM. Matzek has dominant stuff but his 6.2 BB/9 is a little scary. 15. Kyle Gibson – RHP – MIN – 6’6″ 210 – 10.23.87. College: Missouri Drafted: 1st Round (23rd overall) 2009. Gibson doesn’t possess true ace “stuff” but he’s a good bet to have a solid MLB career. 16. Simon Castro – RHP – SD – 6’5″ 210 – 4.9.88. Signed: Dominican Republic 2006. Castro skipped high A and put together a solid campaign in AA ahead of schedule. 17. Zach Wheeler – RHP – SF – 6’3″ 180 – 5.30.90. High School: Dallas (GA) Drafted: 1st Round (6th Overall) 2009. San Francisco’s newest pitching phenom had a solid 2010, his first as a professional. Like Matzek, he’ll need to keep the walks in check. 18. Mike Minor – LHP – ATL – 6’3″ 210 – 12.26.87. College: Vanderbilt Drafted: 1st Round (7th Overall) 2009. The former Commodore was much more dominate in 2010 than I anticipated (10.9 K/9). While he was hit hard after his August 9th call up, he should open the season in Atlanta. 19. Jordan Lyles – RHP – HOU – 6’4″ 185 – 10.19.90. High School: Hartsville (SC) Drafted: 1st Round Supplemental (38th Overall) 2008. I’m not as high on Lyles as most and the reason is primarily the 9.2 H/9 line he’s had in his minor league career. 20. Chris Archer – RHP – TB – 6’3″ 180 – 9.26.88. High School: Raleigh (NC) Drafted: 5th Round (Indians). Archer has put together back to back great seasons as a Cubs farm hand. We’ll see if he carries that momentum with him to the Tampa organization. 21. Jenrry Mejia – RHP – NYM – 6’0″ 160 – 10.11.89. Signed: Dominican Republic 2007. I’m not a fan of the way the Mets handled Mejia in 2010, but he’ll enter 2011 focused on starting. He can always use a future move to the bullpen as plan B. 22. Casey Kelly – RHP – SD – 6’3″ 210 – 10.4.89. High School: Sarasota (FL) Drafted: 1st Round (30th Overall) 2008. The Red Sox signed Kelly away from a Tennessee football scholarship with the promise that they’d let him play shortstop. After he fizzled out with the bat, they convinced him to devote himself to the mound. He had a stellar 2009 but stumbled in 2010. Kelly’s stock is still high and he was the centerpiece on a package that landed Adrien Gonzalez. 23. Jake Odorizzi – RHP – KC – 6’2″ 175 – 3.27.90. High School: Highland (IL) Drafted: 1st Round Supplemental (32nd Overall). A promising season in the Midwest League propelled Odorizzi be named the top prospect in Milwaukee prior to being shipped to Kansas City as part of a prospect package that returned Zack Greinke. 24. Alex White – RHP – CLE – 6’3″ 200 – 8.29.88. College: North Carolina Drafted: 1st Round (15th Overall) 2009. White led his Tar Heals team to Omaha in 2009 with a mid 90’s fastball and a tumbling splitter. His first full season as a professional was largely successful using that same repertoire. He’ll spend 2011 in AAA Columbus so I’ll have some video soon. 25. Dellin Betances – NYY – RHP – 6’8″ 245 – 3.23.88. High School: New York Drafted: 8th Round 2006. Reminds me of Seattle’s Michael Pineda. Maybe it’s because they’re both built like NFL Tight Ends. 26. Drew Pomeranz – LHP – CLE – 6’5″ 230 – 11.22.88. College: Mississippi Drafted: 1st Round (#5 overall) 2010. The 2010 college pitching draft class provided good depth and star power at the front and I think Pomeranz is the best in the bunch. 27. A.J. Cole – RHP – WAS – 6’4 180 – 1.5.92. High School: Winter Springs (FL) Drafted: 4th Round 2010. The Nationals secured their draft A grade on their 2010 draft by signing Cole away from his Miami (FL) commitment for $2,000.000. 28. Tyler Skaggs – LHP – ARI – 6’4″ 195 – 7.13.91. High School: Venice (CA) Drafted: 1st Round Supplemental (40th Overall – LAA) 2009. Skaggs was on his way to having a breakout year when the Angles sent him and Joe Saunders to Arizona for Dan Haren and he didn’t slow down when he switched teams. 29. Anthony Ranaudo – BOS – 6’7″ 230 – 9.9.89. College: LSU Drafted: 1st Round Supplemental (39th Overall) 2010. Ranaudo entered the 2010 season in a three horse race with Bryce Harper and Jamison Taillon but stumbled out of the gate. Shoulder soreness sidelined him early and he wasn’t able to get on track upon his return. I still like his potential to become a Roy Halliday type work horse, but he’s no sure thing to get there. 30. Stetson Allie – RHP – PIT – 6’2″ 220 – 3.13.91. High School: St. Edward (OH) Drafted: 2nd Round 2010. I went back and forth on whether or not to include Allie on this list. I’ve gotta respect prep arms that can hit triple digits, but he’s going to walk a lot of batters. It’ll be a roller coaster ride but it’ll be fun to watch. Click here for my scouting report on Allie. How is John Lamb not any top 30 list? I like Lamb a lot. I guess I just like Montgomery and the other 29 guys a little more. My first draft of my top 30 had Banuelos in the 27-30 range but ultimately I think he's going to end up in the bullpen as a LH specialist. I think his talent is such that the Yankees will have a need for him in that role sooner rather than later and also, at 5'10″ 155 the pen might be the best spot for him. Thanks for the comment. Cosart, Lamb and Duffy just didn't make the cut. I could have easily listed 100 starting pitching prospects, but wanted to give a more detailed look at the 30 I like the most. Scheppers came in at #4 on my relief pitcher rankings and Delgado came in at #12 in the list above.